For the cartoon series, see Marsupilami (1993 TV series). For the band, see Marsupilami (band). Marsupilami is a comic book character created by André Franquin, first published on 31 January 1952 in the Franco-Belgian comics magazine Spirou. Since then it appeared regularly in the popular Belgian comics series Spirou et Fantasio until Franquin stopped working on the series in 1968 and the character dropped out soon afterward. In the late 1980s, the Marsupilami got its own successful spin-off series of comic albums, Marsupilami, written by Greg, Yann and Dugomier and drawn by Batem, launching the publishing house Marsu Productions. Later, two animated shows featuring this character, as well as the Marsupilami Sega Genesis video game and a variety of other merchandise followed. The asteroid 98494 Marsupilami is named in its honour. The name is a portmanteau of the words marsupial, Pilou-Pilou (the French name for Eugene the Jeep, a character Franquin loved as a kid) and ami, French for friend. Marsupilami's adventures had been translated to several languages, like Dutch, German, Greek, Catalan, Spanish, Portuguese and several Scandinavian languages. More than three million albums of the Marsupilami series are claimed to have been sold by Marsu Productions. One album of Spirou and Fantasio featuring Marsupilami, number 15, was translated to English by Fantasy Flight Publishing in 1995, although it is currently out of print. Plans on releasing number 16 ended halfway through the translation process, due to bad sales. In 2007, Egmont's subsidiary Euro Books translated albums number 4, 5, 7, 8, 9, 10, 11 and 14 for the Indian market. In 2013, Dupuis bought Marsu Productions and its characters, thereby allowing a new production of Spirou and Fantasio adventures including Marsupilami. The marsupilami is a black-spotted yellow monkey-like creature with dog-like ears. Male marsupilamis have an incredibly long, strong, flexible, prehensile tail, used for almost any task. Female marsupilamis have a much shorter tail, but still long compared to real animals. Both the male and female are able to use their tail as a weapon, by tightening the end into a fist and the remainder of the tail into a spring-like spiral for maximal force. This attack was responsible for the Danish and Norwegian translators choosing words similar to "spiral" over "marsupial" as the creature's name. Unlike the males, the females also walk on the tips of their toes. When the animal rebounds, he makes the noise: "Boing". Males also have eyes that are not completely separate while females have two separate eyes. Female marsupilamis also have a totally different voice than the males. Males say "houba" most of the time, while females say "houbii". According to the L'Encyclopédie du Marsupilami, they are monotremes like the platypus and echidna, which explains why they lay eggs while having mammalian features. "The Marsupilami" refers originally to the individual captured and then adopted by Spirou and Fantasio, which they never bothered to name because he was the only known specimen. The Spirou et Fantasio album Le nid des Marsupilamis is mostly concerned with a documentary-within-the-comic about the life of a family of marsupilamis still living in the wild in Palombia. The spin-off comics later drawn by Batem star those, and the title of the series now refers to the - also unnamed - father in this family, and not to Spirou's original Marsupilami. In these series, Marsupilami's wife is referred to as Marsupilamie (a female version of the name) but their three young are named, respectively, Bibi, Bibu and Bobo. Mars le noir (Mars the Black) is another specimen, which first appears in the album Mars le Noir. A former captive marsupilami, he first finds it hard to live again in the forest. After failing to seduce Marsupilamie, he becomes jealous of Marsupilami and nearly gets into a fight with him. Later, he meets a black female marsupilami, named Vénus, who becomes his mate. In Baby Prinz, another specimen, an elderly male who lives in a zoo, is featured. Altogether, that comes to eight specimens in Palombia, plus Spirou and Fantasio's pet. Marsupilamis can come in colours of yellow, yellow with black spots, dark blue, white, white with black spots, and dark blue with yellow spots. They can also be black. Only the yellow, yellow with black spots and dark blue marsupilami's show up in cartoon. 4. Spirou et les héritiers (Spirou and the Heirs, 1952). First appearance of the Marsupilami. 5. Les voleurs du Marsupilami (The Marsupilami Robbers, 1952, after an idea by Jo Almo). This story picks up exactly where Spirou et les héritiers ends. 9. Le repaire de la murène (The Murena's Hideout, 1955). 15. Z comme Zorglub (Z is for Zorglub, 1960, with Greg (writing) and Jidéhem (backgrounds)). First appearance of Zorglub. 16. L'ombre du Z (The Shadow of Z, 1960, with Greg (writing) and Jidéhem (backgrounds)). Concludes a diptych. 17. Spirou et les hommes-bulles (Spirou and the Bubble Men, 1959); followed by Les petits formats (The Small Formats, 1960); both with Roba (art). These stories, along with Tembo Tabou, first appeared in a newspaper, Le Parisien Libéré. 18. QRN sur Bretzelburg (Q.R.N. over Bretzelburg, 1963, with Greg (writing) and Jidéhem (backgrounds)). A longer version was published in 1987 in a limited printing. By the late 1960s, Franquin decided to retire from drawing the Spirou et Fantasio series, which was passed to a new artist, Jean-Claude Fournier. Franquin did not give permission for the character to continue appearing in the series after the first Fournier story, Le faiseur d'or ("The Gold Maker"), in which he drew the Marsupilami himself. 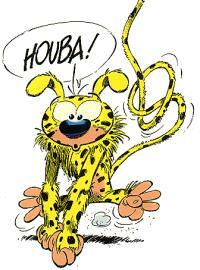 Spirou's Marsupilami did not feature in comics after that. In 1987 however, Franquin launched the Marsupilami series with the new publishing house, Marsu Productions, with Greg and Batem. This series featured the Marsupilami family which had appeared in Le nid des Marsupilamis. Later, Greg abandoned the series, and other collaborators were chosen by Franquin, such as Yann, Fauche and Adam. The first published album of the series is La Queue du Marsupilami. In 2002, an album #0 was published, consisting of short stories featuring the Marsupilami, drawn by Franquin before 1987. The series, drawn by Batem, has survived André Franquin. Opération Attila, 2011. Art by Batem, story by Colman. 0. Capturez un Marsupilami (Capture a Marsupilami, 6/2002) (Short-Story collection). Art and story by Franquin. 1. La Queue du Marsupilami (The tail of Marsupilami, 10/1987). Art by Batem and Franquin, story by Greg. 2. Le Bébé du bout du monde (The baby of the end of the world, 6/1988). Art by Batem and Franquin, story by Greg. 3. Mars le Noir (Mars the Black, 3/1989). Art by Batem and Franquin, story by Yann. 4. Le Pollen du Monte Urticando (The pollen of Mount Urticando, 11/1989). Art by Batem and Franquin, story by Yann. 5. Baby Prinz (10/1990). Art by Batem, story by Yann. 6. Fordlandia (11/1991). Art by Batem, story by Yann. 7. L'Or de Boavista (The Gold of Boavista, 10/1992). Art by Batem, story by Yann. 8. Le Temple de Boavista (The temple of Boavista, 10/1993). Art by Batem, story by Yann. 9. Le Papillon des cimes (The butterfly of the summit, 10/1994). Art by Batem, story by Yann. 10. Rififi en Palombie (4/1996). Art by Batem, story by Xavier Fauche and Eric Adam. 11. Houba Banana (7/1997). Art by Batem, story by Xavier Fauche and Eric Adam. 12. Trafic à Jollywood (7/1998). Art and story by Batem. 13. Le Défilé du jaguar (The fashion show of the jaguar, 9/1999). Art by Batem, story by Kaminka and Marais. 14. Un fils en or (A golden child, 6/2000). Art by Batem, story by Bourcquardez and Saive. 15. C'est quoi ce cirque !? (What's this circus! ?, 9/2001). Art by Batem, story by Dugomier. 16. Tous en Piste (Everyone to the ring, 6/2003). Art by Batem, story by Dugomier. 17. L'orchidée des Chahutas (The orchid of the Chahutas, 6/2004). Art by Batem, story by Dugomier. 18. Robinson Academy (6/2005). Art by Batem, story by Dugomier. 19. Magie Blanche (White magic, 11/2006). Art by Batem, story by Colman. 20. Viva Palombia (6/2007). Art by Batem, story by Colman. 21. Red monster (4/2008). Art by Batem, story by Colman. 22. Chiquito Paradiso (4/2009). Art by Batem, story by Colman. 23. Croc Vert (5/2010). Art by Batem, story by Colman. 24. Opération Attila (20 May 2011). Art by Batem, story by Colman. 25. Sur la piste du Marsupilami (4/2012). Art by Batem, story by Colman, Chabat and Doner. 26. Santa Calamidad (11/2012). Art by Batem, story by Colman. 27. Coeur d'étoile (11/2013). Art by Batem, story by Colman. 28. Biba (11/2014). Art by Batem, story by Colman. 29. Quilzèmhoal (11/2015). Art by Batem, story by Colman. 30. Palombie secrète (04/2017). Art by Batem, story by Colman. L'Encyclopédie du Marsupilami, published in 1991 is an "Encyclopedia" about the natural history of the Marsupilami, not a comic book. Text is by Cambier and Verhoest, art by Batem and Franquin. Gaston et le Marsupilami was published by Dupuis in 1978. This album groups all the short stories featuring both Gaston Lagaffe and Marsupilami, previously published in Spirou magazine. All these strips were then published in the album Capturez un Marsupilami. In December 2006, an illustrated book series featuring the marsupilami as the main character was created in the Bibliothèque Rose Collection, published by Hachette. Scenarios are taken from the animated series Mon ami Marsupilami. A short lived series produced in connection to the TV-series were published 1993-1994 in the American Disney Adventures magazine. Some stories were also reprinted in the German magazine Limit. Several Marsupilami cameos and tributes have been produced in Franco-Belgian comics; among the earliest in Jijé's series Blondin et Cirage, in the volume Les soucoupes volantes (1956), where the characters Blondin and Cirage find the creature Marsupilami Africanis, a slightly different species than the South American Marsupilamus Fantasii. Disney's version of the Marsupilami first appeared on television in Raw Toonage in 1992, and was then spun off into his own eponymous show on the CBS network and Syndication in 1993. Marsupilami's supporting characters included among others Maurice the gorilla, Stewart the elephant, Eduardo the jaguar, Leonardo the lion, and Norman the poacher. The original Marsupilami stories by Franquin never encountered a gorilla or elephant, since these species are native to Africa, while the marsupilami in the comic was said to come from South America (however, in the album "Le dictateur et le champignon", the Marsupilami escapes from his cell on a boat with a gorilla). Another change is Marsupilami can speak in difference to his comic counterpart that can only mimic sound like a parrot. In this version, Marsupilami is voiced by Steve Mackall. Shnookums and Meat was a secondary segment on this show. There were thirteen episodes in the series, and the series lasted one season. Reruns of the show were aired on The Disney Channel (from October 1994 to June 1995), and later on Toon Disney. Animators Tony Bancroft and Michael Surrey are in the character design ending credits. A second series, this time produced in France, premiered in March 2000 and ran for 26 episodes in France's Canal J. Produced by Cactus Animation, Marathon Production & Marsu Productions, this series more closely followed the character in the original comic. In this first season, Marsupilami lived adventures alone or with his family (his wife Marsupilamie and their three young, Bibi, Bibu and Bobo). For example, in one episode he saved a group of circus animals, got them back to the city and saved the circus from closing. In another, he had to go to the city again to save one of his young, captured by their constant enemy, the hunter Bring M. Backalive. In the 15 episode second season, called Mon ami Marsupilami (translated as My friend Marsupilami in the Disney Channel version), Marsupilami and his family become best friends with a human family, the Du Jardin, that comes to live near them. Amanda is a Marsupilami researcher, while her husband Jean-Pierre is a computer technician that works from home and they have two children, Teo (Leo in the Disney Channel version) and toddler Zoe. Leo and Marsupilami become best friends and they have lots of adventures, with both new friends and old enemies, like Backalive. The third series, started in 2009, features a preteen boy named Hector and his aunt Diane, who are going to live in the jungle for one year to study its fauna and flora. They become the best friends with the Marsupilami family. Their main enemies are megalomaniac industrialist and jungle-hater Felicia Devort, who plans to level out the Palombian jungle and build the Devort City megalopolis in its place, and her two henchmen, Stroy and Blouprint. Their old enemy, hunter Bring M. Backalive, also appears. The fourth series, translated to Our Neighbors the Marsupilamis, featured the Marsupilami family living with veterinarian Bernard Vanderstadt and his four children Sarah, Iris, Isidore and Zoe. Their mother, Caroline, frequently contacts them by phone, but appears in the last three episode. Once again Backalive makes an appearance. This series has been broadcast in 36 countries, among them Germany (Super RTL), Algeria (Programme National), Belgium (RTL TVI), Canada (Télé-Quebec), Estonia (ETV), Bulgaria (Super7), Spain (Antena 3, Disney Channel, Toon Disney and TV3), Finland (MTV3), Cyprus (CyBC), Greece (Alter Channel), Ireland (RTÉ), Italy (Italia 1), Portugal (Prisvideo), Switzerland (TSR), Russia (THT Network), Hungary (Minimax (Hungary)), Slovenia (RTV), Serbia (Happy TV (Season 1), Minimax (Serbia)), Montenegro (Happy TV (Season 1), Minimax (Serbia)), Bosnia and Herzegovina (Minimax (Serbia) (no Season 1)), Former Yugoslav Republic of Macedonia (Minimax (Serbia) (no Season 1)), Morocco (2M TV), Turkey (Yumurcak TV), Sri Lanka (Rupavahini), Mexico (Canal 22 (the Houba Houba Hop! season), Brazil (Rede Globo), Venezuela (RCTV), Indonesia (B-Channel and RCTI), Malaysia (TV3 and TV9), the Africa Pansat (CFI), and Latin America (ZAZ (first season only), the Near East and Middle East (TV5), (E-Junior), Vietnam (HTV7), Thailand (United Broadcasting Corporation), South Korea (EBS), Iceland (Uppeldi EHF), and South Africa (SABC). Sur la piste du Marsupilami (On the Trail of the Marsupilami) is a live-action, adventure-comedy directed by Alain Chabat and released in 2012. Chabat himself stars in the movie alongside Jamel Debbouze, Frédéric Testot, Géraldine Nakache, Lambert Wilson, Patrick Timsit, Liya Kebede, Aïssa Maïga and The Great Khali. Though Marsupilami and his family are featured prominently, the movie features new characters rather than any of the established cast from the comics or television shows. The central focus is on French reporter Dan Geraldo (Chabat) and Palombian vet Pablito Camaron (Debbouze), whose name humorously translates to Little Pablo Shrimp, as they go searching for the indigenous Paya people led by Queen Paya (Kebede). The duo end up in a complicated plot involving the Marsupilami, an evil botanist (Testot) who discovers the elixir of youth, a major (Timsit) the botanist teams up with to overthrow the Palombian president (Wilson) and said president's love for Celine Dion. A wax figure of a Marsupilami was manufactured and exhibited at the Musée Grévin, a museum displaying realistic statues of famous personalities, along with two other famous Franco-Belgian comics characters, Tintin and Asterix. Many commercial products have been created by several companies: clothes (Avance Diffusion), shoes (Léomil), clocks, watches, decoration, dishes (Tropico), figurines (Pixi and Plastoy), cuddly toys (Nounours), socks (Agofroy), schoolbags (Hasbro), school products (Oberthur), linen (MCT), puzzles (Jumbo), underwear (United Labels). Marsupilami appears on a stamp created by the French Poste in 2003 (n° 3569). The official website www.marsupilami.com claims to have more than 25,000 subscribers. The Marsupilami is a fairground attraction in Asterix and the Big Fight. Marsupilami is honoured by Asterix illustrator and occasional writer Albert Uderzo on page 11 of Asterix and Obelix's Birthday: The Golden Book. ^ franquin.com. "Franquin-Une vie-1952" (in French). ^ "Review Crew: Marsupilami". Electronic Gaming Monthly. Ziff Davis (82): 31. May 1996. ^ "ProReview: Marsupilami". GamePro. No. 93. IDG. June 1996. p. 71. ^ "Marsupilami". Next Generation. No. 21. Imagine Media. September 1996. pp. 160–2. ^ "Marsu Productions : Merchandising – Promotion – Edition tout pour la BD et bande dessinée" (in French). Marsuproductions.com. Archived from the original on 2 February 2009. Retrieved 10 January 2014. ^ "Les albums en bandes dessinées du Marsupilami - Marsupilami 23 : Croc Vert". Retrieved 26 August 2011. ^ "Les news du Marsupilami - Plongez dans une nouvelle aventure !". Retrieved 26 August 2011. ^ a b c d e "Les albums Marsupilami". Marsupilami.com. Retrieved 24 August 2015. ^ Character: Marsupilami on the Inducks. ^ The Disney Channel Magazine, Vol. 12, no. 6, October/November 1994: pp. 36, 46, 58. ^ The Disney Channel Magazine, Vol. 13, no. 2 (typo in magazine: should be "no. 3"), April/May 1995: pp. 26, 36, 44. ^ The Disney Channel Magazine, Vol. 13, no. 4, June/July 1995: p. 48. ^ "Les dessins animés Marsupilami - Saison 1". Retrieved 26 August 2011. ^ "Les dessins animés Marsupilami - Saison 2". Retrieved 26 August 2011. ^ "Les dessins animés Marsupilami - Saison 3". Retrieved 26 August 2011. ^ "" Nos voisins les Marsupilamis " – Bienvenue en Palombie ! (Houba !)*". Retrieved 29 August 2016.